It takes a lot to tempt me to turn on the oven in the summer, but trying out a new breed of chicken made the cut. Roasting a chicken is not only easy, it keeps the flavor of the bird very evident, and I wanted to be able to compare and contrast the taste of our black australorps with last year's dark cornish. Since I was heating up the house anyway, I figured I should fill that blistering cavern all the way up. 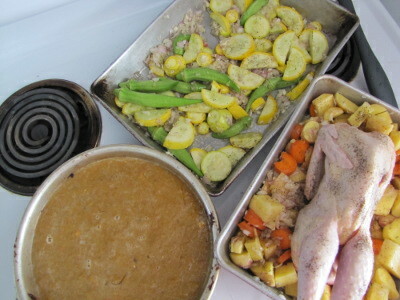 Roast roots went under the chicken to bake in the drippings, a modified early summer ratatouille slid onto the bottom rack, and a butternut pie fit into the space left behind. 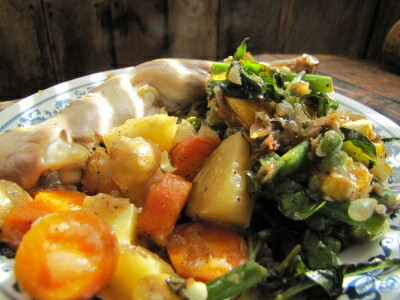 All told, the only off farm products involved in the main course were salt, pepper, butter, and olive oil (although the pie had more storebought components.) And now I won't have to do anything except briefly heat up the leftovers for the next two or three meals. Maybe that hour and fifteen minutes of oven time was actually energy efficient? By the way, the roast australorp got the Mark seal of approval. My taster said he couldn't tell the difference between this year's and last year's birds, which is high praise since cornish are supposed to be one of the best tasting chickens around. I thought the australorp might have been just a hint less tender than the similarly aged dark cornish, but that's what you get when your broilers run around and eat bugs. The broth I'm cooking up from the bones has brilliant yelllow fat on top, a sign of omega 3s and good nutrition, so we know the chicken is good for us. Our chicken waterer kept our broilers well hydrated and happy. Thanks for the updates on the heritage breed chickens. I'm eagerly reading every post about them. We will be butchering some by the end of this month probably. I posted some information on my blog about cooking with heritage breed chickens, a few people had negative experiences with raising them, mostly I think it's accepting they are just not the same chicken we grew up eating, which is rather the point of the experiment, but hard to adjust our expectations about what chicken should be like. Are you happy enough with your results to give it a try again? I thoroughly enjoyed your post on the topic, and it got me thinking about perhaps letting some of the pullets grow a bit bigger before we slaughter them. The only downside is having to kill more birds to get the same amount of meat if you want tender chicken that's easiest to cook with, but that also means more bones to make broth, and chicken-broth-based soups have become one of our standbys. Killing just two birds at a time the way we've been doing turns the experience into a semi-spiritual one rather than an endurance test, so I can't complain about that. So, short answer --- yes, we'll be trying it again! Great to know! I'm so glad to hear some positive experiences. I think we will try some earlier, then some in the 14-20 week stage, and see what works the best for us, then we will have the culled layers we will stew. I won't have any roasting age because we will have to process them before it gets too cold, no room to keep them. I'm ok with needing to use more than one for a meal, it's just an adjustment in thinking, and all that wonderful chicken stock! I think you are right a couple at a time is much more manageable, farmers weren't processing all of their chickens at once like we have been doing. We are also doing meat rabbits, I'm still learning to like it and cook with them, but it seems they may be less expensive than the chickens, they are certainly less labor intensive. We may do less chicken and make up the difference with rabbit. We might try rabbits one of these days, but so far we only have so much experimenting time to go around. Meanwhile, you might try a few things to make your chickens less expensive. Another option is to raise your chickens later in the year so that you're giving them lots of scraps as you process food in your garden. Around the beginning of July, we started giving our chickens so many monster squash, cucumber tops, etc., that we cut back on their feed. Also, I discovered last year that the longer you wait to kill your birds, the worse their feed to meat conversion ratio is. That means that each additional pound of meat is costing you more money. If you're buying chicks rather than raising your own, you have to factor that cost in, and it might make more sense to wait until the chickens are older. But if you become self-sufficient with chicks, it might make sense to kill more of them young. I hope that's not too much critique all at once! Thanks for the great advice. I'm somewhat limited by my climate, if I started in July I wouldn't make more than 8 weeks before we have to slaughter, we are into serious hard freezes and our garden is completely gone by then too. They have picked their yard bare, but they do eat lots of scraps from our home and garden. We've tried to tractor them to reduce food costs, but we kept losing them to foxes so we had to make the stationary yard with the fence buried under the ground. They do get let out (supervised) into 2 adjacent grassy areas, but that's also limited by time. A few times per day I hand pick large piles of chickweed and other weeds from our garden paths(it grows more than I thought could be humanly possible!). We also have friends sharing their vegetable scraps for us. Hopefully that makes some difference in feed costs. Good thoughts on the length of growing, maybe harvesting the smaller birds earlier, is cheaper than waiting until they get a little bigger... We'll have to see. We hatched all of our own chicks, so that part was free, it was just not financially worth it to pay more than $4 per chick . Hatching our own was great fun. I'm surprised the Barred Rock foraged less. I haven't seen a difference between ours, they all forage equally well. We really don't have a ton of barred rocks, what we have is 4 each of australorps, buff orphington, barred rock and Amercauna, our rooster is Barred Rock though, so yes all of our chicks are 1/2 (although they look all barred rock!). Funny how we all have different experiences with the same breeds. I had chosen the Barred Rock rooster because of temperment, and they are the fastest growing of the heritage breeds that do well in the cold and 6 months of confinement necessary here. I have to say for a rooster hater, I love him, he is wonderful, not at all mean. He was also slow to mature compared to my Amercauna which seems beneficial for growing for meat. I find that our Australorps are so docile that they are at the bottom of the pecking order, and spend a lot of their time sitting in the nest boxes and foraging less than the other breeds. I actually had considered culling them all out this year. Hmmm.... I may reconsider this based on your experience. I may also consider an Australorp rooster someday when I need to replace mine. We got a variety of breeds that play nice together, because we used to raise all one breed, but then they all molted at the same darn time and we ended up with no eggs for extended periods of time. From that respect, they do well, and by egg selling, they pretty much support themselves for feed costs. Critique away, I'm always interested in hearing, new ideas! One more thing you might want to keep in mind is that chickens are omnivores, but are nearly carnivorous in the wild. Giving them lots of greenery will keep your flock healthy and will make the eggs and meat higher quality, but won't do much to offset your feed costs. In your setting, I might consider finding a lot of autumn leaves or other free mulch and covering the ground in their run since it's bare anyway. That would attract earthworms to the surface, so the chickens could scratch through and find some high quality food.